Zhuang Hong Yi was born in 1962 in Sichuan, China. After he finished his artistic education at the Sichuan Fine Arts Institute - the oldest and one of the most prestigious art academies in China - in Chongqing, he and his wife (the artist Lu Luo, b. 1971) moved to Groningen, The Netherlands, where they both became apprentices at the Minerva Academy. After finishing his studies in 1997, Zhuang quickly received recognition as an artist. Many international exhibitions followed. The artist’s Chinese roots remain clearly visible in his work, both thematically and through the use of his materials. His residence in the Netherlands over the past two decades has profoundly influenced his work. The renowned and incredibly unique Flowerbed series are a clear example of this crossover of Eastern and Western influences. Even after many years of residence in Europe, Zhuang still holds his main studio in Beijing, where he travels several times a year to work, collect new materials and to find inspiration. The flower motif dominates Zhuang’s work. He works patiently and religiously year after year on this subject alone. In Chinese culture the flower is a significant image, which carries countless meanings and emotions. Zhuang’s ‘Flowerbeds’ are crafted from delicate hand-cut pieces of painted rice paper, which the artist has bent and folded into hundreds of tiny buds. Utilizing a traditional Chinese material, the works also represent traditional Chinese aesthetics: they are meditations on color, nature and form. Most recently the colorchanging effect introduced in his work, enhances the traditional flow of a flower field in Spring time, yet is also utterly contemporary and abstract. The canvas paintings bear the influence of Impressionism and other Western artistic practices. Zhuang’s impasto strokes are expressive and unconfined. Colors melt together, and paint drips down the canvas, seeping over a collage of delicately unfolded rice paper flowers. The almost sculptural three-dimensionality makes his work both painting and object. Messiness, variety and chance are all embraced, evidencing Zhuang’s liberation in terms of both aesthetics and technique. Like the Flowerbed series, these paintings draw the viewer in, encouraging contemplation as they immerse us in a tapestry of color and form. Zhuang’s work is built upon his native country’s well-established artistic traditions and boundaries, which he has married with the Dutch encouragement of freedom of style. Embracing his present without losing his past the artist strives to define a sense of self that exists between the two. This is the personal struggle that Zhuang enacts visually and through his artistic processes, which vacillate between phases of controlled planning, emotional gesture, and careful editing. Objects of appealing beauty, mysterious and alluring - at once both foreign and familiar - are the result. According to the circumstances, the viewing angle, one’s social or physical status, one’s perception of evolving reality, everyone’s image of reality is singular, subjective and can not be confused with that of the others. When certain people see « La vie en rose » others can see it in black. In this lies the complexity of our perception, of our existence. The Dutch art scene has quickly and lovingly embraced the works of Zhuang Hong Yi. Some of Zhuang’s first exhibitions were for instance in the ‘Kunsthal’ in Rotterdam (1999) followed by a solo show in 2001 in the Groninger Museum, a preeminent, internationally renowned Dutch museum for contemporary art. After this first major solo exhibition, Zhuang received invitations to present his spectacular works in museums and galleries all over the world. In 2007, the Groninger Museum honored him and his wife Lu Luo with a large duo exhibition called ‘Atelier Beijing’. In 2013 his work was selected for the 55th Venice Biennial. Zhuang has exhibited in China, the U.S, Mexico and throughout Europe, including Germany, France, Belgium, Italy, Poland, Switzerland and Spain. His second solo exhibition in Sydney, Australia within just one year followed in 2017, illustrating the international resonance of his work. 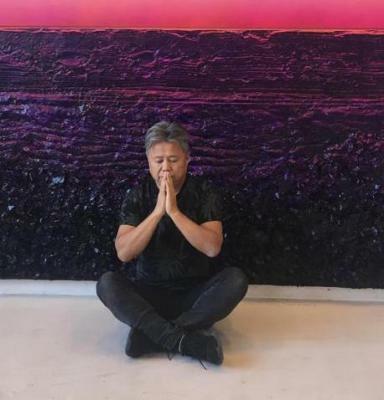 Zhuang Hong Yi has been the subject of multiple museum exhibitions and his work is held in numerous esteemed public and private collections worldwide. 2015 - The Armory Show, SmithDavidson Gallery, New York, U.S.A.
2014 - Solo: Interbrokers Offices, Miami, U.S.A.